As a sinner who has much for which to make reparation before he dies, I have found the recordings of the Sunday sermons of Saint Alphonsus de Liguori eight years ago to be very sobering. Oh, yes, of course, I "learned" nothing new in the reading of these sermons. I was, however, reminded in very stark terms that my sins deserve eternal damnation, that I am lost, that I have no hope for salvation, that I will have to say "farewell" to my wife and daughter and to others at the General Judgment of the Living and the Dead as I am cast, body and soul, into Hell for all eternity. This is what my sins deserve as a matter of strict justice. As one who is nevertheless sincerely sorry for each of my many sins, I can only hope that the Queen of Heaven and Earth, the Queen of All Saints, the Queen of Mercy, the very Mother of God herself, the Blessed Virgin Mary, will continue to intercede for me "nunc et in hora mortis meae" so that I will not perish forever in the fires of Hell and will be the unmerited beneficiary of the ineffable Mercy won for us by the shedding of every single drop of the Most Precious Blood of her Divine Son, Our Blessed Lord and Saviour Jesus Christ, on the wood of the Holy Cross. Our Lady, Mary our Immaculate Queen, is the hope of my poor soul, so steeped in the after-effects of disordered self-love and dozens of other sins and defects that have flowed from those sins. I do not want to perish forever in the fires of Hell. I desire to know the glory of the Beatific Vision of Father, Son, and Holy Ghost in the company of Our Lady and Saint Joseph and my Guardian Angel and my patron saints and all of of the angels and saints in Heaven. I desire to possess God for all eternity in Heaven. To gain this blessed possession, however, I must have recourse to Our Lady, who will indeed plead for me now and at the hour of my death if I keep calling upon her, especially by means of her Most Holy Rosary, wherein are recalled the very mysteries of our salvation, and by fulfilling the obligations associated with the promises of being enrolled in the Brown Scapular of the Order of Carmel (O. Carm.) that she gave to Saint Simon Stock on this date, July 16, in the year 1251, seven centuries before my own birth. One day, through the Rosary and the Scapular, I will save the world. Wear the Brown Scapular continuously. Observe chastity according to one’s state in life (priest, consecrated religious, married, single). Recite daily the Little Office of the Blessed Virgin Mary or observe the fasts of the Church together with abstaining from meat on Wednesdays and Saturdays or with permission of a priest, say five decades of Our Lady’s Most Holy Rosary or with permission of a priest, substitute some other good work. In the night between the 15th and 16th of July of the year 1251, the gracious Queen of Carmel confirmed to her sons [the Carmelites] by a mysterious sign the right of citizenship she had obtained for them in their newly adopted countries [of the West]; as mistress and mother of the entire religious state she conferred upon them with her queenly hands the scapular, hitherto the distinctive garb of the greatest and most ancient family of the West. O giving St. Simon Stock this badge, ennobled by contact with her sacred fingers, the Mother of God said to him: 'Whosoever shall die in this habit shall not suffer eternal flames.' But not against hell fire alone was the all-powerful intercession of the Blessed Mother to be felt by those who should wear the scapular. In 1316, when every holy soul was imploring heaven to put a period to that long and disastrous widowhood of the Church, which followed in the death of Clement V, the Queen of Saints appeared to James d'Euse, whom the world was soon to hail as John XXII; she foretold to him his approaching elevation to the Sovereign Pontificate, and at the same time recommended him to publish the privilege she had obtained from her Divine Son for her children of Carmel--viz., a speedily deliverance from purgatory. 'I, their Mother, will graciously go down to them on the Saturday after their death, and all whom I find in purgatory I will deliver and will bring to the mountain of life eternal.' These are the words of our Lord herself, quoted by John XII in the Bull which he published for the purpose of making known the privilege and which was called the Sabbatine Bull on account of the day chosen by the glorious benefactress for the exercise of her mercy. We must not never disparage the approved private revelations of the Queen of Mercy to help us erring sinners fight off the ravages of sin in our daily lives and to help us to be truly repentant for our sins as we endeavor to cooperate with the graces won for us by her Divine Son on the wood of the Holy Cross and that flow into our hearts and souls through her loving hands to amend our lives and to live penitentially in reparation for our sins and those of the whole world as the consecrated slaves of her Divine Son through her own Sorrowful and Immaculate Heart. It is no accident that Our Lady appeared clothed as the Queen of Mount Carmel in her last apparition to Saint Bernadette Soubirous in the Grotto of Massabielle near Lourdes, France, on July 16, 1858, one hundred fifty years ago today (! ), or that she appeared clothed as that same Heavenly Queen in the last of the apparitions that was seen by Lucia dos Santos during the Miracle of the Sun in the Cova da Iria near Fatima, Portugal, on October 13, 1917. We must embrace this approved private revelations and recognize them as mercies that Our Lady has pleaded for us from her Divine Son, Our Blessed Lord and Saviour Jesus Christ. Indeed, these mercies have been extended to us in this Age of Mary, starting with Our Lady's apparitions, starting on July 18, 1830, to Saint Catherine Laboure in the convent of the Daughters of Charity on the Rue de Bac in Paris, France, that gave us, as a result of the apparition on November 27, 1830, the Miraculous Medal, which converted the Catholic-hating Jew Alphonse Ratisbonne on January 20, 1842. It was in that same convent of the Daughters of Charity on the Rue de Bac that Our Lady appeared to Sister Justine Bisqueyburo on September 8, 1840, to give to her the Green Scapular the salvation most specifically of non-Catholics and fallen away Catholics. The Brown Scapular is a garment in which we must be enrolled and fulfill the obligations attached to its promises. The Green Scapular is, as my dear wife Sharon, whose apostolate is to dispense Green Scapulars and then to pray "Immaculate Heart of Mary, pray for us now and at the hour of our death" every day for each person to whom she has given this badge of Our Lady's love and protection, a "get out of jail free pass" for those who have no other hope, humanly speaking, to be introduced to the true Faith. People convert to the true Faith (and I mean to the true Catholic Faith) because of the Green Scapular. We must remember that it was on Mount Carmel that Elias slew the false prophets of Baal, and that, as a Catholic priest noted seven years ago, Eliseus, his servant, asked for a "double portion" of Elias's spirit. The priest, Father Denis McMahon, who was preaching at the Requiem Mass of Father Vincent Joachim Bowes, O.C.D., on April 24, 2009, noted that it was that same "double spirit" of Elias was given by Our Lady when she gave Saint Simon Stock her Brown Scapular of Mount Carmel on July 16, 1251, as a protection against all spiritual dangers, including the false ecumenism of our own day which so offends God in our day as it offended Him as it was practiced on Mount Carmel when Elias slew the prophets of Baal. False ecumenism makes a mockery of His First Commandment. Father Vincent Joachim of the Holy Family, Father McMahon said, stressed time and time again the importance of the Brown Scapular of Our Lady of Mount Carmel as a protection against the false ecumenism of the Modernists that has been practiced with such abandon by the conciliar "popes" and their minions. Father Vincent Bowes, O.C.D., the beloved Father Vincent Joachim of the Holy Family, loved God and he mourned that He was being so offended by men who claimed to be representatives of the Catholic Church on earth. Do we mourn the offenses given to God by the conciliar revolutionaries as they praise false ecumenism and engage in acts of idol worship that many millions of Catholics, including those in the first centuries of the Church who refused to offer even one grain of incense to the pagan idols of the Roman Empire as well as those Catholics who shed their blood for refusing to acknowledge the nonexistent legitimacy of various Protestant sects or of according them any mark respect and praise? We should do well to consider that the Brown Scapular of Our Lady of Mount Carmel is a protection against the false religion of conciliarism itself. The readings for Matins in today's Divine Office provide us with great inspiration of this great feast day, reminding us that the first Catholic church on Mount Carmel was founded by followers of Saint John the Baptitst who had a devotion to Elias and Eliseus. These holy men who bore the spirit of Carmel, the mountain on which Elias had destroyed the false idols of Baal, were in Jerusalem on Pentecost Sunday. These holy me heard the preaching of Saint Peter, filled with the gifts and fruits of the Third Person of the Most Blessed Trinity, God the Holy Ghost, and were among the three thousand converted at the begining of the missionary work of the first pope and his fellow bishops, thereafter settling on Mount Carmel. Here is a story to the effect that many men who had kept a tradition of the holy Prophets Elijah and Elisha, were made ready by the preaching of John the Baptist to hail the coming of the Messiah, and that, when the Apostles having been filled with the Spirit upon the holy day of Pentecost, spake with divers tongues and worked miracles by calling upon the Name of Jesus which is above every other name, these men, seeing and being assured of the truth, straightway embraced the faith of the Gospel, and that on account of their singular love toward the Most Blessed Virgin, whose conversation and friendship they were able to enjoy, they paid her the respect of building her a little Chapel, the first which was ever raised in honour of this same most pure Maiden, and which stood upon that part of Mount Carmel whence the servant of Elijah had in old days espied that manifest type of the Virgin, the little cloud like a man's hand, arising out of the sea. 3 Kings xviii. 44. Now this new Chapel they repaired oftentimes day by day, and in their sacred ceremonies, prayers, and praises, honoured the most blessed Virgin as the particular Guardian of their Congregation. For this reason they came to be everywhere called the Brethren of Blessed Mary, of Mount Carmel, and the Supreme Pontiffs have not only confirmed to them the right to use this name, but have granted particular indulgences to all those who so call either the Order itself, or any particular member thereof. Her name and protection are not the only gifts which the most bountiful Virgin hath given them yea, she hath given them the badge of the Holy Scapular, which she delivered to the Blessed Englishman Simon Stock, even an heavenly garment whereby this Holy Order is marked, and harnessed against all assaults. Moreover, in old times, when this Order was unknown in Europe, and not a few were instant with Honorius III. to put an end to it, the most gracious Virgin Mary appeared by night to the said Honorius, and flatly commanded him to show kindness to the Order and to the men belonging thereto. We must give thanks to Our Lord always for holding back the justified wrath of His Divine Justice against us erring sinners by acceding to the pleas of His Queen Mother to permit her to provide us with sacramentals that can help us, provided with have the proper dispositions and seek earnestly to cooperate with Sanctifying and Actual Graces, to get home to Heaven as members of the Catholic Church, outside of which there is no salvation, despite our worst efforts to go to Hell on our own unaided powers! We have a Blessed Mother who loves us, whose Immaculate Heart was pierced through and through with Seven Swords of Sorrow because of what our sins did to her Divine Son, our own Divine Redeemer, during His Passion and Death and as she endured the nightmare of saying goodbye to Him at His Burial prior to His Resurrection on Easter Sunday forty hours later. How can we continue to grieve her Sorrowful and Immaculate Heart by means of our sins, our ingratitude, our tepidity, our irresolute, if not dissolute, natures? How can we not fly unto her patronage as our very life, our sweetness and our hope (vita, dulcedo, et spes nostra) with every beat of our hearts, consecrated as they must be to the Most Sacred Heart of Jesus through her own Sorrowful and Immaculate Heart, out of which that Sacred Heart was formed and from which It received the Most Precious Blood to redeem us by Its being poured us to Its last drop on the wood of the Holy Cross? How can we not make every temporal sacrifice imaginable to situate ourselves so that we will have daily access to the unbloody re-presentation of the Sacrifice of the Cross offered at the hands of true bishops and true bishops in the Catholic catacombs where no concessions at all are made to conciliarism or to the nonexistent legitimacy of its false shepherds who dare to esteem the false idols destroyed by the Prophet Elias on Our Lady's very mountain, Mount Carmel itself? How, how, my friends, how is it possible that we can hold back anything from the Mother of God, she who has pleaded and won permission from her Divine Son to extend us so many helps to aid our sanctification and salvation? How can we waste our time with the "talking heads" of television or radio, listened to naturalistic, Judeo-Masonic, anti-Incarnational and semi-Pelagian blather day and night, when we should be spending our time praying Rosaries in reparation for our sins and those of the whole world, including praying Rosaries for the conversion of all of the enemies of the Faith, including for the very conciliar revolutionaries who blaspheme God and mock His honor and majesty and glory by esteeming the symbols of false religions and by praying for the "unity" of a false "religion" such as Anglicanism, which replaced and then corrupted the Faith the young Englishman, Saint Simon Stock, learned to love and to defend with such ardor as a chosen soul of Our Lady? How can justify wasting our time on the delusions of naturalism, whether of the false opposites of "left" or of the "right," when Our Lady has given us work to do to convert the world to the true Faith and thus back to the Social Reign of her Divine Son, Christ the King, as well as giving us the sacramentals to help us to do so? Oh, my friends, let us fly unto the patronage of Our Lady of Mount Carmel today. Let us cling to her motherly care and protection, taking seriously our enrollment in her Brown Scapular as we distribute blessed Green Scapulars and Miraculous Medals and Rosaries to all those whom God's Providence places in our paths so that those outside of the Faith can be converted and thus enrolled in that Brown Scapular for themselves. There is Heavenly work for us to do. Let us quit our selfishness and our pessimism and anger and disordered pride once and for all. Let us be about the business of saving souls, starting with our own by taking seriously True Devotion to Our Lady, as taught by Saint Louis de Montfort, to see to it that we can be of true Heavenly assistance to others as we use the rest of our lives profitably for the work of the Kingdom of Heaven which we desire to maintain our souls by means of Sanctifying Grace at all times and to possess for all eternity in Heaven. 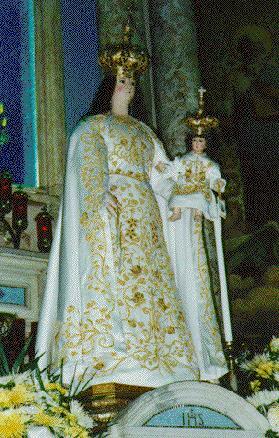 Queen of Carmel, hear the voice of the Church as she sings to thee on this day. When the world was languishing in ceaseless expectation, thou wert already its hope. Unable as yet to understand thy greatness, it nevertheless, during the reign of types, loved to clothe thee with the noblest symbols. In admiration and in gratitude for benefits foreseen, it surrounded thee with all the notions of beauty, strength, and grace suggested by the loveliest landscapes, the flowery plains, the wooded heights, the fertile valleys, especially of Carmel, whose very name signifies 'the plantation of the Lord.' On its summit our fathers, knowing that Wisdom had set her throne in the cloud, hastened by their burning desires the coming of the saving sign: at length there was given to their prayers what the Scripture calls perfect knowledge, and the knowledge of the great paths of the clouds. [Job 37:16] And when He who maketh His chariot and His dwelling in the obscurity of a cloud had herein shown Himself, in a nearer approach, to the practiced eye of the father of prophets, then did a chosen band of holy persons gather in the solitudes of the blessed mountain, as heretofore Israel in the desert, to watch the least movements of the mysterious cloud, to receive from it their guidance in the paths of life, and their light in the long night of expectation. O Mary, who from that hour didst preside over the watches of God's army, without ever failing for a single day: now that the Lord has truly come down through thee, it is no longer the land of Judea alone, but the whole earth that thou coverest as a cloud, shedding down blessings and abundance. Thine ancient clients, the sons of the prophets, experienced this truth when, the land of promise becoming unfaithful, they were forced to transplant into other climes their customs and traditions; they found that even into our far West the cloud of Carmel had poured its fertilizing dew, and that nowhere would its protection be wanting to them. This feast, O Mother of our God, is the authentic attestation of their gratitude, increased by the fresh benefits wherewith thy bounty accompanied the new exodus of the remnant of Israel. And we, the sons of ancient Europe, we too have a right to echo the expression of their loving joy; for since their tents have been pitched around the hills where the new Sion is built upon Peter, the cloud has shed all around showers of blessing more precious than ever, driving back into the abyss the flames of hell and extinguishing the fire of Purgatory. Statue of Our Lady of Mount Carmel, Our Lady of Mount Carmel Church, East 115th Street, New York, New York. The Crown was sent by Pope Leo XIII. O my God, in union with the Immaculate Heart of Mary (here kiss the Brown Scapular), I offer Thee the Most Precious Body, Blood, Soul and Divinity of Our Lord, Jesus Christ, joining with it my every thought, word and action of this day. O my Jesus, I desire today to gain every indulgence and merit I can, and I offer them, together with myself, to Mary Immaculate, that she may best apply them to the interests of Thy Most Sacred Heart. Saint Elias, pray for us. Saint Therese of the Child Jesus and the Holy Face, pray for us. Saint Andrew Corsini, pray for us. Saint Mary Magdalen de Pazzi, pray for us. Blessed Don Nuno Alvares Pereira, the King's own Champion, pray for us. All ye holy Carmelites, pray for us! Father Vincent Bowes, O. C. D., pray for us.